Spring is here, so it’s time to get outside and enjoy your garden, its many people’s favourite time of year. It is also the ideal time to clean and organise your garden shed, this will ensure all your tools are accessible when you want them, it will also reduce the need for stepping over tools and searching for items when they are required. Pick a dry day and remove everything from the shed; although this may seem excessive it will allow you to thoroughly clean the interior and also throw away any items that are no longer required or need to be replaced. Remember to take all items off shelves, benches and hooks. With the shed empty you can also fully view and access any repairs that are required and tighten or add additional hanging hooks. Once the shed is clean and in good condition you can then move your items back in. Whilst your tools and equipment are outside this is a good time to inspect them, check for rust and general safety. If they are no longer usable then replace them; do not risk using tools which have deteriorated and could become dangerous. Consider which items you will not be using very often and place these at the back of the shed, conversely tools and equipment which will see regular use should be located to the front. Some items are generally used together such as a small fork and trowel or flower pots and compost; it is, therefore, worth considering storing these items close to each other. Gloves should be stored near the front of the shed, perhaps on a hook by the door. It’s sensible to keep the top surface of benches clear which will allow working space for potting seedlings etc. Also, it’s best to place compost, sand or bags of soil on lower bench shelves or even the floor; if the bags then splits it will be much easier to clear up. When clearing out your shed check for evidence of pests such as mice. Block up any holes in the shed and if you consider that they may still be able to get inside set some traps (remember that humane traps are also available). Should your shed have electric then check the wiring is in good condition and all the points are safe and in good working order. Replace any light bulbs if required. 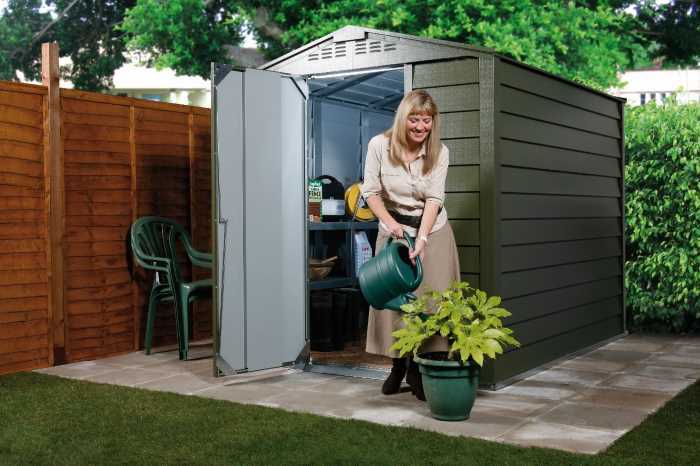 Now your shed is clean, tidy and ready to use for another year – get out in the garden and enjoy it. Getting your bicycle ready for spring and beyond. Spring is coming but does it have to mean a shed-load of work?